"Saltwater Joys" is perhaps one of the most popular and well-known songs to come out of Newfoundland and Labrador. Written by Wayne Chaulk of Buddy Wasisname and the Other Fellers, the song is a celebration of the simple pleasures of outport life. 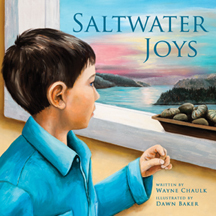 This beloved song is now available in book form, with Dawn Baker's stunning illustrations capturing the joys of living in Newfoundland. From enjoying quiet mornings in the cove, to admiring icebergs in the spring and brightly coloured leaves in the fall, to breathing in the salty ocean smells and watching the sun set over the water, the words to the song come alive within these pages. Complete with sheet music at the back, Saltwater Joys is as beautiful as the song that inspired it.